Everyone knows I genuinely love food and I’ve been fortunate enough to take quite a few food tours on my travels. 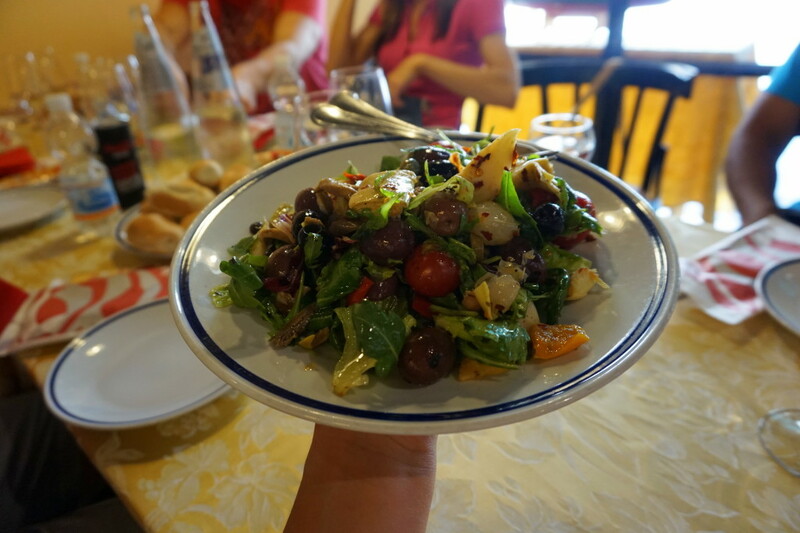 My favorite cuisine alongside Mexican is Italian, so when I visited Venice I couldn’t miss the opportunity to take another tasty tour – Venice Bites Food Tour. I soon found out that it was one of the best decisions I made on my trip to Italy. The tour was organized by a cute expat couple – Maya and Adam. They were some of the most enthusiastic foodies and guides I’ve ever met. I think our whole group could easily see that Adam and Maya weren’t just treating this tour as a job. They actually loved meeting people and telling us everything they knew about Venice. 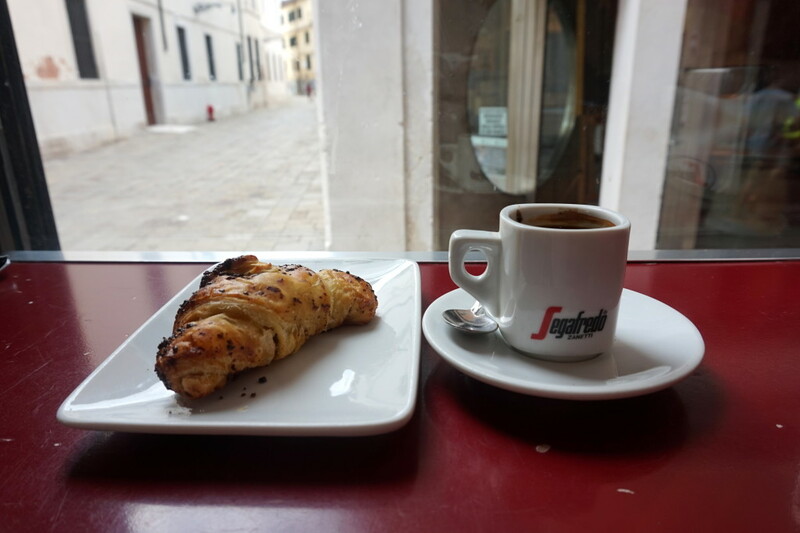 We hit off the tour with a typical Italian breakfast consisting of a cute pastry and espresso with grappa. For those who aren’t familiar with Grappa: it’s an Italian liqueur that turned out to be much stronger than I thought it would be. I wasn’t surprised when we found some tipsy locals at the cafe with us despite it being only 11am. After breakfast we proceeded to a gondola workshop. Maya and Adam explained how expensive it is to make a gondola and we could see that they’re all actually handmade. Can you believe that? 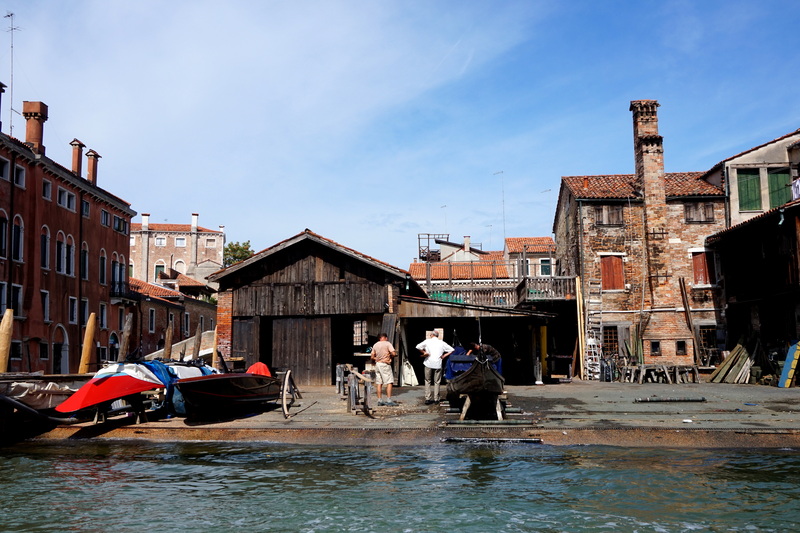 This explains why gondola rides cost 80 euros for just half an hour. I also had no idea that not just anybody can become a gondolier. It’s a very family oriented business and striclty regulated. Later on we quickly ended up at our second stop full of tasty Venetian sandwiches known as tramezzini. 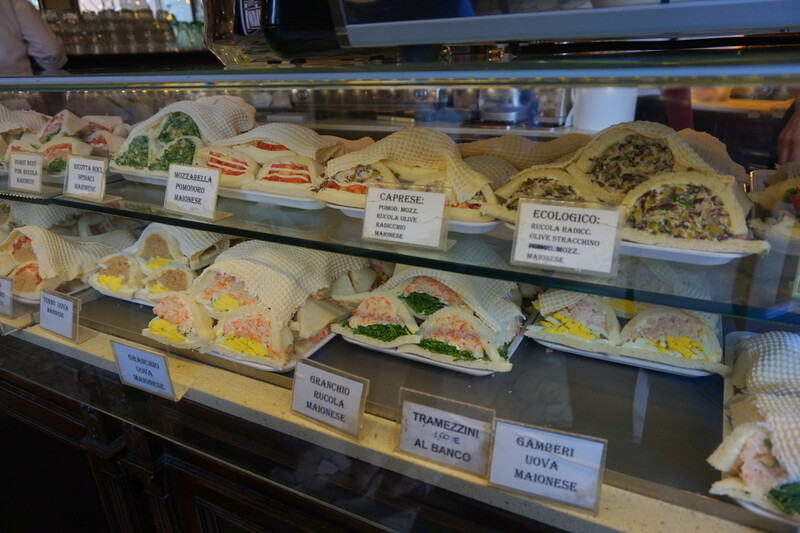 Tramezzino is basically a sandwich made of a soft bread with the crust removed, and filled with whatever you want. I chose one with spinach, ricotta and walnuts and I wasn’t disappointed. We also received a few glasses of wine and the whole group had a chance to bond together, making the tour even more fun than it already was! To take a short break from eating we walked around Venice, escaping from tourist routes into less travelled alleys. We ended up at a floating fruit & vegetable market. Adam & Maya explained to us that the market was operated by just one family for years until they finally decided to pass it on to another family. The whole time trying to keep it a family business instead of making it an expensive tourist attraction. You can’t see it every day in Venice. The food tour in Italy wouldn’t be authentic without some gelato! Before lunch we headed for a scoop of some amazing coconut ice cream. Yummy! Did I say lunch? Despite all the food we already had, we were all curious what lunch was going to be. When Maya informed us that we were going to have seafood linguini, I expected some regular pasta. But even before we had a chance to get to the main dish we were served salad, pita bread, and a lot of wine. Along with the wine we also received some welcoming fireworks. Noone could really figure out why they played us a wedding march as well. Unfortunately when the tour was about to end I had to head back to San Marco Square. Maya was kind enough to take me to my destination, as if you’ve ever been to Venice you know that it’s next to impossible not to get lost. As a bonus I had a chance to get on board a local public transport which may look like a gondola, but is operated by two people instead of just one gondolier. Unlike expensive vaporettos, these forms of public transportation cost only 0.50 for residents of Venice and 2 euros for visitors. 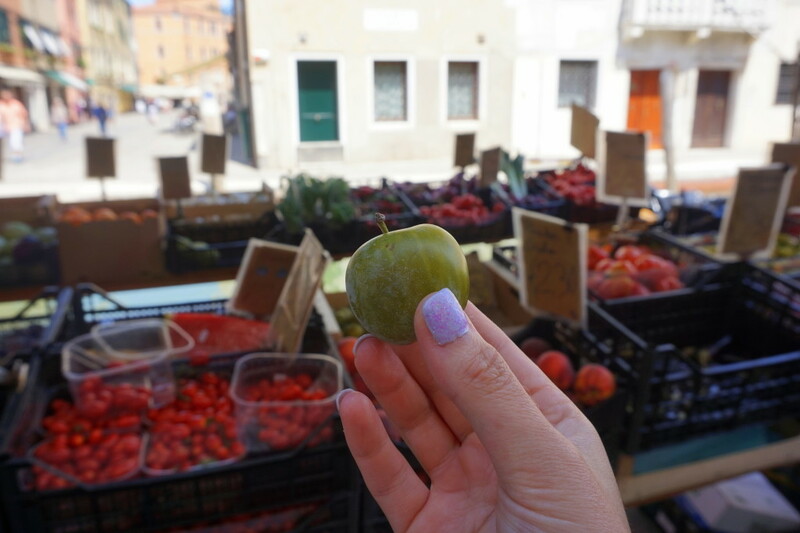 I’d recommend the Venice Bites Food Tour to anyone who wants to sample a bit of local life in Venice and experience some non-touristy places. You couldn’t have found better guides in the city than Adam and Maya. Thanks for an amazing experience guys! Yep, would a quick Venice weekend might be on the cards! Nice read! 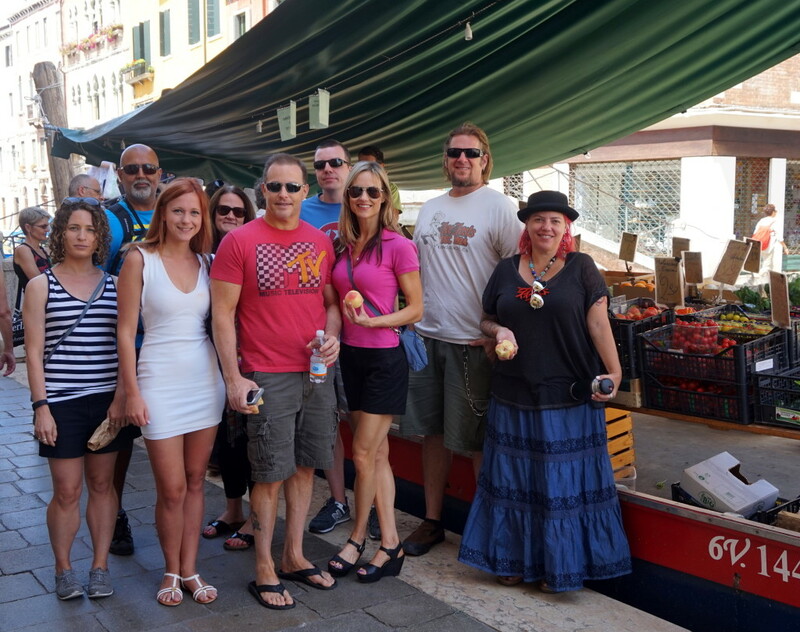 Nice read, happy smiles, yep Venice does look beautiful! Please tell me how much you paid for the Gondoliers – they wanted 110 EUROs for 1/2 hour, and we decided to just do the Vaporetto. I always thought they were centrally regulated, but alas – it’s Italy, albeit the North. We spent an entire week in Venice, and actually saw many of the landmarks you’ve photographed. Well, every goldelier had a price on the side – 80 euros for a whole boat for half an hour… how weird they wanted 110 from you! Yum!! Food tours are the best 🙂 You get to try it all! 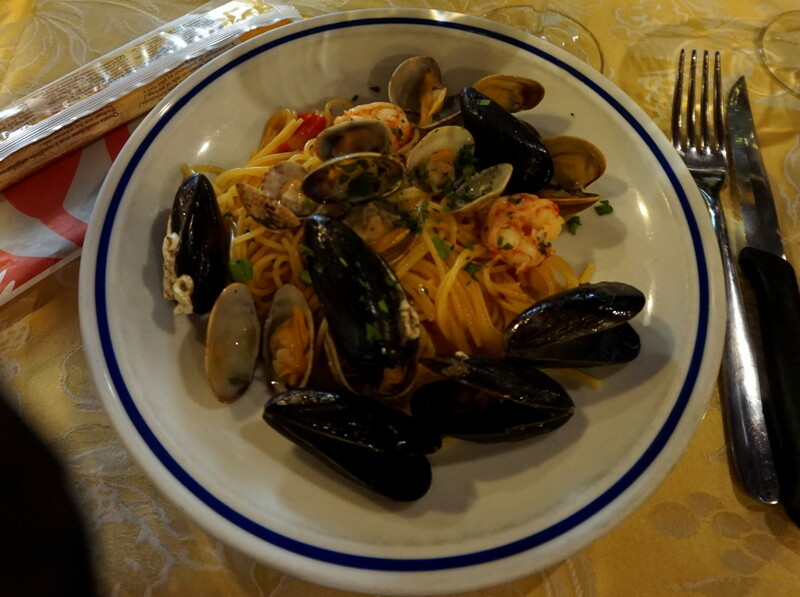 I love Italian food but sometimes with Venice I guess that often gets overlooked, but wow, lots of great stuff to try. Nice read! Those foods really look so appetizing, cant wait to visit Venice! So many told us to skip Venice, but I am so glad we don’t listen to people. Venice is wonderful. Why did people tell you to skip Venice? Wish we knew about this tour. 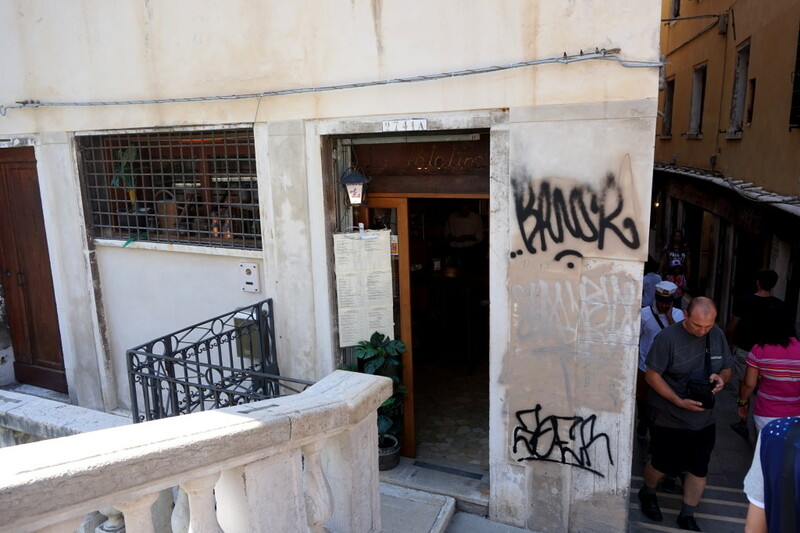 We didn’t have the best food experiences in Venice and left quite disappointed. Will take note for next time! I’m sure you wouldn’t be able to move haha!